I also settled on a palette of colors that I felt would be attractive and reflect what I thought of as a Deli aesthetic. The unique double "SS" in "DELICATESSEN" was borrowed from the neon sign—one of many small details that I felt would help keep continuity between the restaurant and the truck. I added some other elements such as "Since 1931" that Bonnie wanted. In my first iteration for the truck my feeling was that I'd try it as a white truck—a good clean look— and adjust the graphics accordingly. We also decided that it would be a good idea to have a slogan and, after much deliberation, settled on "...home of the Kibitz Room". The Kibitz Room is the dive bar/cocktail lounge that's off in a corner of Canter's Deli. 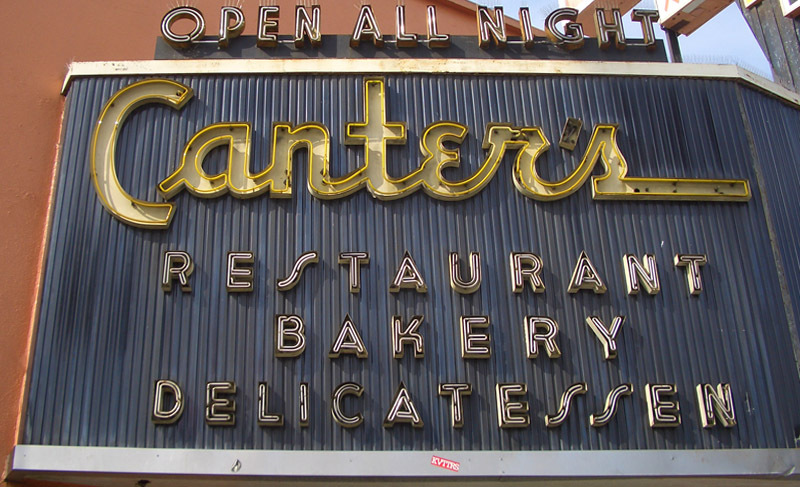 Like Canter's, it's an LA institution that just seems to keep going and going. In “Art Imitates Life…Imitates Art #3″ I’ll post photos of the actual truck wrapping, and also of the finished truck.